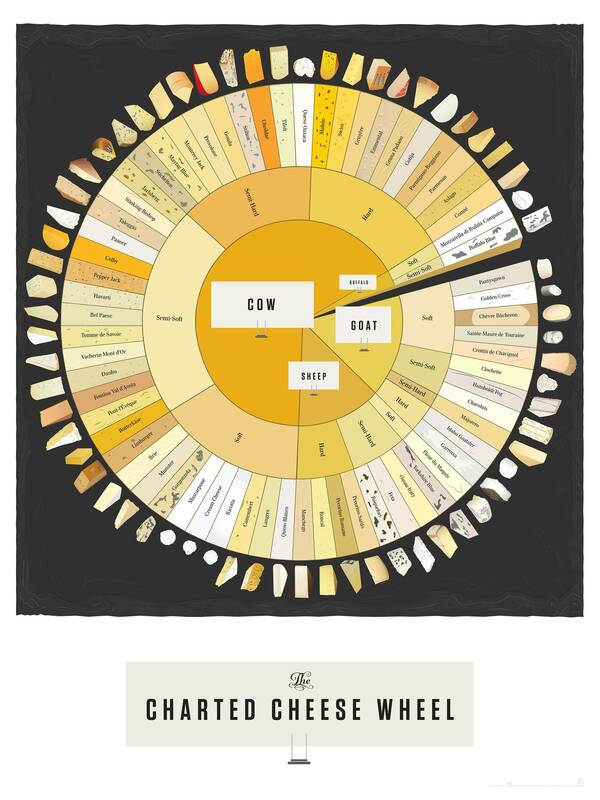 Came across this graphical cheese wheel. Missing a bunch of good varieties but good eye cheese, nonetheless. You can purchase it here. Making cheese can be enjoyable, cost-effective, and easy. Just ask Charlie White, a close friend of FDM, who endeavored such a feat more than 7 years ago. During that year, notable for Barry Bonds' anointment as new home-run King (with asterisk) and Apple's unveiling of its first iPhone, White Farms' brought us its premiere batch of Parmigiana-Reggiano. 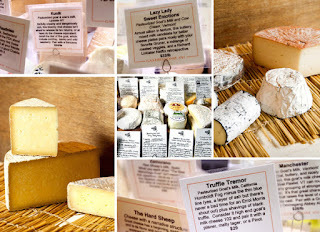 That fromage was reported to be, simultaneously, "semi-tart" and "semi-sweet" and was able to heighten the "senses" with its "complexity" and "rich nutiness". Seven years and 4 iPhone versions later, following in the footsteps of White Farms for outstanding artisanal cheese production, Lee Street Dairy delighted FDM this week with its inaurgural fromage. 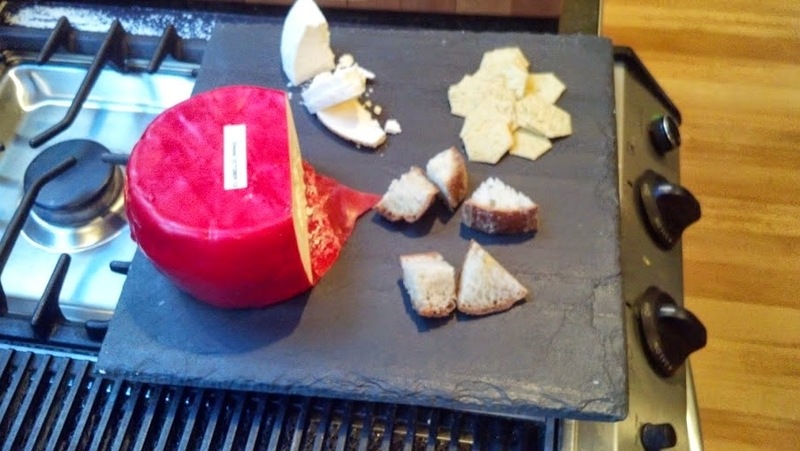 Their cheese was a moderately sharp, delicious wheel of 7-month farmhouse white cheddar (see pictures- above/below, with with bread and crackers). Lee Street's Paris Wallace and Kristen Lynch, amateur cheesemongers based out of Cambridge, MA, started with Ricki's Basic Cheesemaking Kit in October 2013. What makes this kit so useful is that it comes with everything you need: a basket mold, vegetable rennet, re-usable cheesecloth, the starter bacterial cultures, and recipes. Farmhouse cheddar is just one of the eight different cheeses you can make with this kit-- Ricotta, Gouda, and Colby are other delights. Wallace and Lynch's wheel had the sharpness that you want in a cheddar, but was also appropriately dry and crumbly-- these features usually tend to separate "farmhouse cheddars" from traditional (firmer) cheddars. The difference in texture probably arises because farmhouse cheddars are made by hand and wrapped in cloth, allowing the cheese to "breathe" while ripening. Most traditional or commercially-produced cheddars are wrapped in plastic or wax after the cheddaring process, which prevents the cheese from aging further. FDM looks forward to keeping up with Lee Street Dairy's future cheese endeavors; there are some rumors that an alpine (basement) cave at the Dairy is under construction. We hope that you have stayed inspired and have continued tasting. Many years ago, we blogged about the semi-soft, lactic-heavy Welsh cheese called Caerphilly. 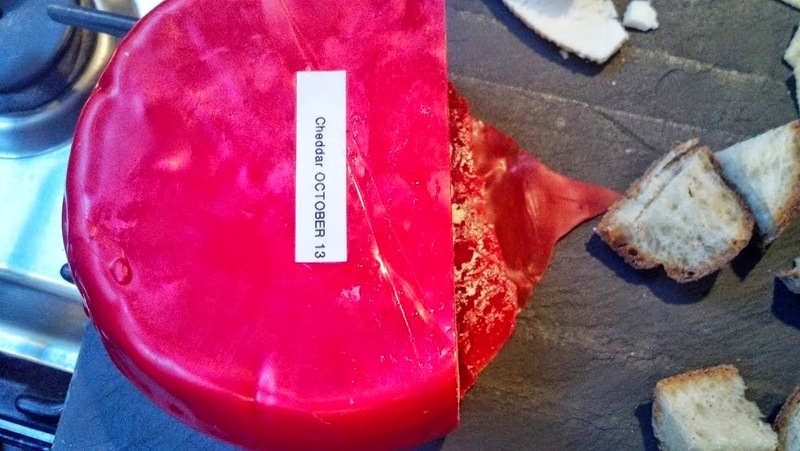 This is a cheese that matures quickly, has a high salt content, and was a favorite among Welsh miners during the 19th Century: it was a purported salve for all of the toxins inhaled underground. The Welsh town of the same name today hosts an annual festival, during the last week of July, called The Big Cheese. In any case, we recently had the opportunity to try another Welsh cheese, slightly similar to Caerphilly in taste. The cheese is called Landaff and it is produced exclusively by the Landaff Creamery, a small, family-run artisinal cheese operation in a small town in the White Mountains of New Hampshire. (Despite its remoteness, there dose seem to be several ways (a way, other way) to get this cheese wherever you might be). Landaff is a really fantastic and full addition to a cheese course . We found it to have a semi-soft, creamy, slightly chalky, and buttery mouth-feel. It is less lactic-heavy than its Welsh counterpart, but still carries a hint of sharpness. This is a dense cheese and is very filling. Others have said it has a "buttermilk tang". It has been bitter cold here in the Northeast U.S. this week! Stay warm everyone. How Much Cheese is Enough? Recently I was asked to set up some sample cheese plates for a local business. At first I was more concerned with the cheese choice. Only when I was laying the cheese on the plate did I realize how essential the amount of cheese is for such a venture. When I sit down with a piece of cheese I'll often just eat with no regard to how much I've consumed. This, of course, is a testament to my love of fromage. When there are other factors involved (multiple cheeses and extras) it's a whole different story. I set up a few plates. The first was designed to be an all American plate: cheddar, a blue, and a chevre. This combination is nice because you could fill all the cheeses from various regions of the country if you wanted to keep it more local. And on this plate I set out 1.5oz of each cheese along with some filler (almonds, figs, etc). 1.5oz turned out to be way too much cheese. On the next round I went with an Italian theme: burrata, a toscana, and a piave. This time I switched to 1oz of each cheese which was much more manageable. It's possible that even .75oz would have been sufficient but I think 1oz is a nice amount. Filling for one person and share-able for two. And if you keep the cheese choice reasonable, so too will be the cost of the entire cheese plate. At wholesale prices just the cheese (@ 1oz / cheese) was under $2 per plate. And in terms of extras - they mostly hovered around $.30 per item. In order of cost: sliced baguette, figs, chutney, almonds, tapenade. And the only very expensive and very delicious extra was the prosciutto. A guilty pleasure.